Why do railings whistle in the wind? I was recently emailed by Matthew W. Shepherd about a recording he made of wind whistling through railings. Unfortunately, Matthew didn’t have the best recording equipment available, but you can still hear the tones above the general rustling wind noise. So how is the sound made? With a railing one probable cause of a breathy note is an Aeolian tone, which is what causes the soughing sound as wind passes around the needles of pine trees. But I doubt that Aeolian tones caused the sound Matthew heard. The frequency of an Aeolian tone is proportional to the wind speed, so the pitch goes up when the wind blows stronger, and the pitch goes down when the wind decreases. So you expect to hear the tone’s frequency slding up and down as the wind speed varies, causing ghostly glissandi. While the frequency of the railing sound does vary in the recording, it does it in distinct steps. This makes me think that the railing is acting like a flute. Looking at the picture, a small hole can be seen in the pipe just below the top railing. I think this acts like a flute’s mouthpiece. As the wind rushes past, it causes the air within the railing pipe to vibrate. The air column in the pipe will have particular frequencies it naturally vibrates at, the natural resonant frequencies. 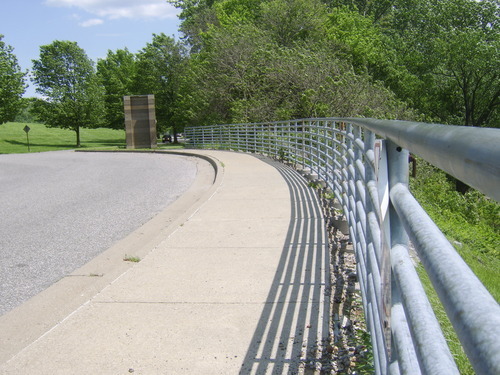 Like a flute, the railing can jump between these different natural resonant frequencies if the wind blows softer or harder. Matthew handily measured the frequencies on his recording: 379, 511, 654 and 782 Hz, and in his blog correctly identifies this as a harmonic series based on 129 Hz (379 = 126*3, 511=128*4, 654=131*5, 782=130*6). If Matthew wanted to confirm his hypothesis, he could start by measuring the dimensions of the railing. The tone at 129Hz should be produced by a pipe (roughly) 132 cm long. So if the hole I can see is acting like a flute mouthpiece, then the railing pipe should be 132 cm high. Another way to test this theory would be to tape over all the holes in the railings and see if the tones disappear. Have you heard any other wind-generated sounds I could investigate? Please comment below. This entry was posted in whistle and tagged aeolian, flute, frequency, ohio, railing, resonance, turbulence, whistle, wind. Bookmark the permalink. I wrote a short paper on this for a carpark which was generating these tones. The balustrade was not hollow but was a series of flat bars. We tested it in the wind tunnel and generated the tone only at specific windspeeds and orientations. I have some recordings if you are interested. Another engineer here in NZ also wrote a paper on a similar problem and did some testing – his paper is better than mine and offers some good ideas. We treated the carpark using lengths of round plastic (or rubber?) at the front of the balustrade flat bars to disturb the flow. Seemed to work well and was cost effective. email me if you want any recordings of the paper(s) I mentioned. Was that the paper in the IOA bulletin a few years ago? We have just designed and installed a subdivision fence (here in NZ) that has raised this exact issue. It is a multi fin style fence made in corten steel. Singing in the wind was never one of my considerations when designing and we have had complaints from the neighbours. Are you able to email me showing the solution you utilised? Any help on this would be greatly appreciated. I have *never* heard anything as exciting come from pine trees though, lots of them (and many varieties) where I live, in Greenwich Park. Tempted as I am to go and listen to them on a windy day I might give it a swerve as they have a tendency to lose branches in high winds. Not heard of Pierre Sauvageot before but I officially like him now. Shame I hadn’t read your blog before you visited “the most tranquil spot” in England. I know of a couple of “singing gates” in Northumberland, one of which is on St Oswald’s Way. They are steel gates with tubular horizontal members the ends of which are open. The “note” (not particularly musical) varies as the gate is opened and closed, presumably as the angle of incidence of the wind changes – as you probably noticed on your “tranquil spot” visit, wind is not uncommon in Northumberland. Neither are close to the border – so they do not disturb the tranquility of “the most tranquil spot”. I live in a high rise on the 22 floor at the corner of the building. Outside on the balcony are hurricane shutters which are folded up after the hurricane season. The reside right at the corner. When wind blows from a direction about perpendicular to the corner there is a high velocity of wind between the shutters and the buildings corner. Sort of a Venturi action but also a very disturbing whistle. I would like to know what I should look for to stop the whistle. A shape edges? What. To describe the shutters, the are pleated type with each pleat about 4 inches wide. Height is about 9 ft. There are about 50 of these pleats all folded together in the group. Any idea how to get rid of the whistle? Thanks for great work Trevor, this post will help me in my job. We just had our deck rebuilt, changing the warped wood for grooved composite boards held together by hidden Trex fasteners. The new deck makes a howling sound when the wind blows. We ruled out the deck balusters and railing, so we know it has something to do with the decking. Our builder is as stumped as are we. Any ideas on how to get to the root of the problem and fix it? We are experiencing the same problem, with our trex deck. Did you ever figure out what the problem was? Yes, we resolved it by having the deck torn out and reinstalled without the Trex fasteners. The boards were placed closer together and nailed directly to the deck supports. Thankfully, the board manufacturer donated the new planks and our contractor didn’t charge us very much to redo it. Thank you for your reply. It sounds like a freight train underneath our deck. I will contact trex, again, and possibly see about a warranty claim. I’m sorry that you had to deal with this as well, it’s terrible! We had hoped that installing a fence around our property would help, but it didn’t. Anyway, thanks again, for your response. Take care, and enjoy your non-howling deck! My problem is wind noise echo into my apartment from a metal chimney liner which I have just had installed for my open flame gas fire. Several cowls have been tried but the noise of wind gusts continue. I have had conflicting and confusing Ideas to fix it (mainly from chimney specialists at a cost) but no definitive and sensible remedies have yet been suggested and I am worried I make the position worse permanently Any ideas would be welcome. Wind tends to create a whistling sound when the cladding or balustrading detail has a wide gap that narrows in the direction of the wind. If the slats or metal bars are perfectly square and parallel they wont tend to cause such a problem but when you have circular or angled elements I believe this causes the issue as the air is compressed. Well, I love that music when railings are whistling in the wind. I think this is could also be from the way the railing breaks the wind flow. We built a new contemporary house with horizontal railing all around a flat concrete roof. We live on the island in Florida, so wind is always there. Now since we moved in, we experiencing a tremendous humming noise from the railings. The aluminum railings are installed with a post in concrete. I am hoping for a solution for the noise reduction if there is any.